Rachel Von | The Journal Gazette The Ash Skyline stands tall at the corner of Harrison St. and Berry St. during August of 2016. The Ash Skyline is one of the new editions to downtown since the filming of Public Access's Street Scenes series in the 1970's. 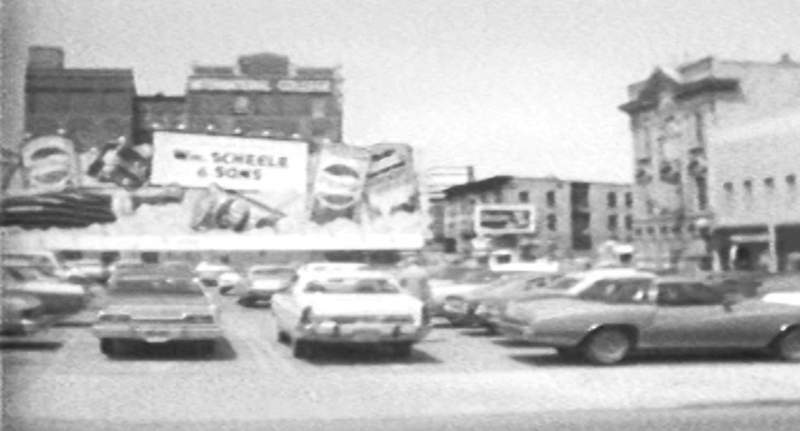 Steven Fortriede | Public Access RIGHT: Buildings and streets on Harrison Street between Berry and Wayne streets look a lot different in this video screenshot from the 1970s, which was shot by Steven Fortriede for Public Access. Rachel Von | The Journal Gazette Steven Fortriede puts together the Sony AVC 3210 Studio Broadcast Box Camera he used while working at Public Access in the 1970s. For some folks, reveling in downtown Fort Wayne’s recent renaissance is a once-a-year treat. They might attend a TinCaps game on a warm summer day or drive by the lighted Santa Claus display on a snowy winter night. Or they might take advantage of Be a Tourist in Your Own Hometown and visit numerous landmarks on an autumn afternoon. That annual event is Sunday, by the way. But thousands of people have witnessed downtown’s transformation up close, on a daily basis. They are the army of workers who fill the hundreds of offices, large and small. Rhonda Bailey-Reed was a recent college graduate, single and working at a downtown mortgage company 31 years ago. "It wasn’t the most fun job in the world," she said of being a foreclosure specialist. So she signed up with an employment agency, which sent her to a new law firm opening in what was then One Summit Square. Bailey-Reed reported for her first day of work as a receptionist/assistant librarian in the eighth-floor office. There was simply a desk and a chair. That’s it. Not even a phone. "I truly remember sitting there thinking, ‘What have I gotten myself into? Nobody is here,’ " she recalls. Deliveries of furniture and other necessities started to arrive that afternoon. It was Dec. 30, 1985. Soon enough, other workers appeared. They included Debra Bengel, a legal administrative assistant. Bengel and Bailey-Reed are the only co-workers remaining from the team that founded Barnes & Thornburg’s Fort Wayne office. It was the Indianapolis firm’s fifth location. Bengel was also in her early 20s and single. She was happily working at another downtown law firm when her boss, Miles Gerberding, persuaded her to follow him to the new office. "He kept saying this was such a great opportunity," she recalled recently. "He had great confidence in me, and I had great respect for him." The newly bustling office mirrored the downtown surrounding it. Bailey-Reed recalled drooling over the fashionable women’s clothing at Nobbson on her lunch hours and popping into a drugstore to buy magazines – something she could actually afford. The drugstore was just down Calhoun Street from Klingler Jewelers, where her grandmother bought her graduation present, a necklace. Bengel pointed to her engagement ring. It also came from Klingler. She recalled going to The Thirsty Camel or Loaf & Ladle for lunch with co-workers. Bailey-Reed, who went on to become an intellectual property assistant at the law firm, would sometimes treat herself to lunch at the Salad Gallery. Most of those businesses – and many more – are gone now. The women can be forgiven for indulging in some nostalgia. 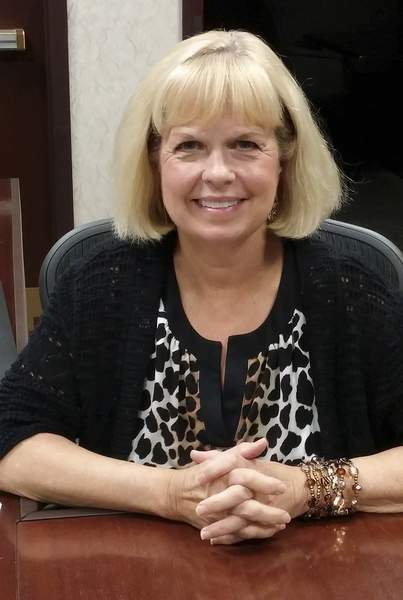 For the first time in 30 years, they are reporting to work at a new address after Barnes & Thornburg moved its office late last month to the new Ash Skyline Plaza. The law firm signed a 15-year lease on 17,000 square feet at 888 S. Harrison St. 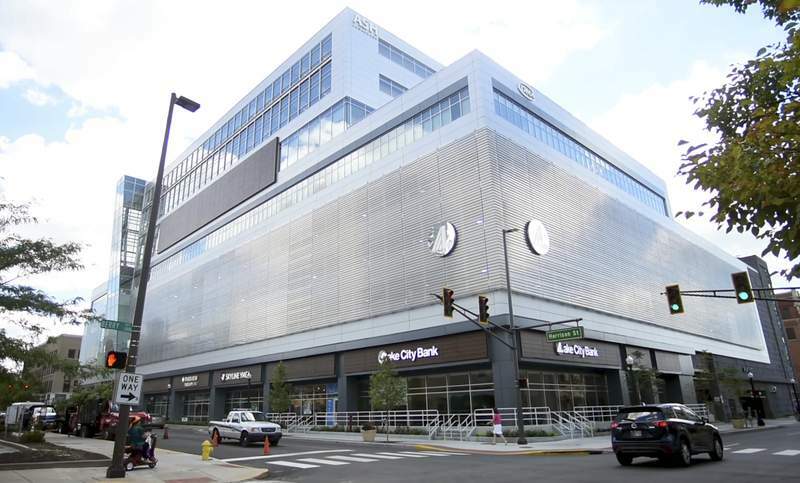 In addition to Ash Brokerage, the nine-story building will have offices for tax consulting firm DuCharme, McMillen & Associates Inc., Lake City Bank and several retailers. 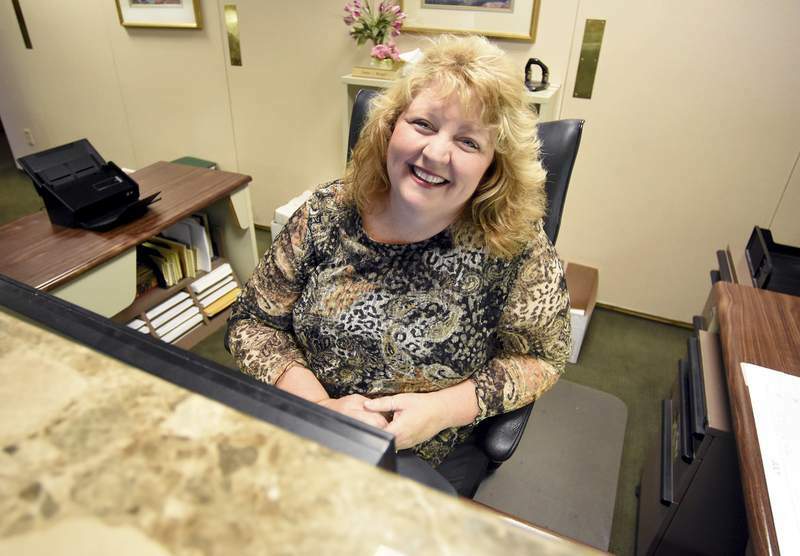 Debbie DeMeritt, executive assistant to Wells Fargo’s regional president, has worked in banking downtown for 25 years. Her office is now on the second floor of the Wells Fargo building. 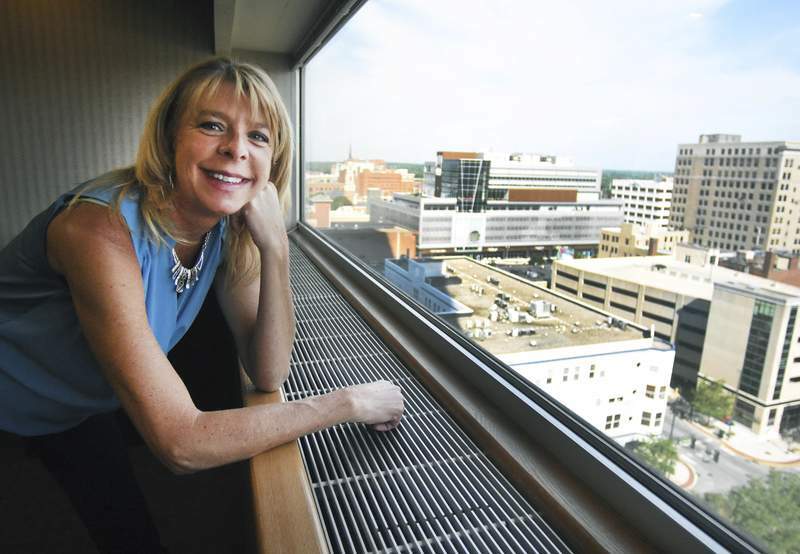 The Fort Wayne native remembers visiting a thriving downtown when she was a little girl. There was Wolf & Dessauer, Stillmans, G.C. Murphy’s and L.S. Ayres. "Nobody missed the window displays" at Christmas, she said. But her early working memories are less from the go-go ’80s and more about the no-go ’90s. In 1991, about the only thing downtown was the City-County Building, courts, banks and some sandwich shops, said DeMeritt, 61. "Between 8 (a.m.) and 5 (p.m.), it was a busy place," she said. "At 5 o’clock, it felt like they folded up the sidewalks." Steven Fortriede was assigned years ago to shoot video of downtown for the Allen County Public Library. The former library director, he explained, was very interested in local history. "It was boring. It was something I thought was absolutely a waste of time," he confessed recently. 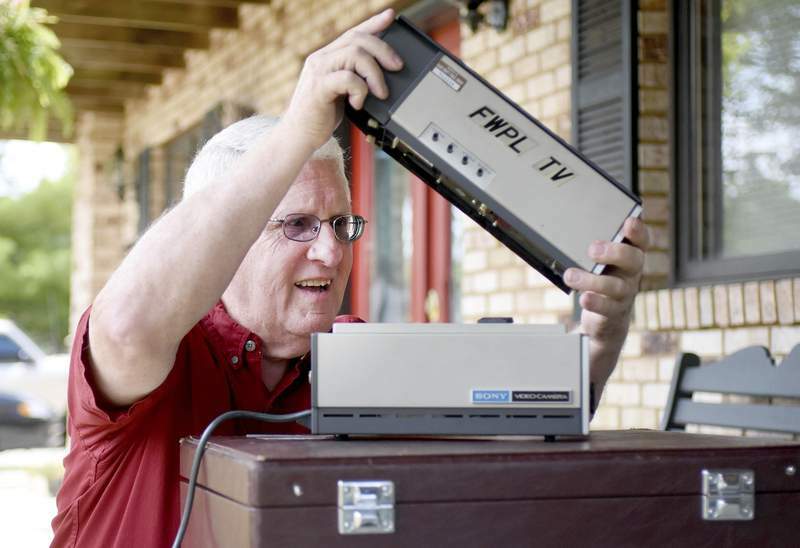 Even so, the retired Huntertown man spent a year compiling about 30 hours of videotape of architectural details on individual buildings block by block. He shot only on days with good weather, good lighting and no snow so that the final result could be edited together. That video was recently discovered and portions are posted on The Journal Gazette’s website, along with a current video view of downtown. While the first video was being shot, the downtown was still pretty busy, but you could see beginnings of activities moving to the suburbs, Fortriede said. When he wasn’t recording, the videographer enjoyed grabbing lunch at Murphy’s or Walgreens’ lunch counter downtown near the main library. "You could buy a full lunch for 80 cents and leave a dime tip," he said, "and everyone was happy." All four downtown workers are impressed by downtown’s new vitality. "There’s always people out at all times of the day," said Bengel, who supported Harrison Square from the beginning. Some of her co-workers now spend their lunch hours walking around the Parkview Field’s concourse. The ballpark is the centerpiece of Harrison Square. Barnes & Thornburg employees also enjoy lunch at The Deck at Hall’s Gas House or grabbing some grub from food trucks at Lunch on the Plaza. Bailey-Reed also supported Harrison Square, which was a controversial project because some people didn’t think millions should be spent on an outdoor venue that would be used only part of the year. But she doesn’t think people should forget that the Grand Wayne Center’s expansion was also a significant boost for downtown. DeMeritt thinks the Downtown Improvement District also deserves credit. The nonprofit has created annual events that draw families downtown, including Buskerfest in the summer, the Zombie Walk before Halloween and Night of Lights the night before Thanksgiving. She hasn’t been on board with all the downtown development, however. "I was skeptical about Parkview Field, very skeptical," she said. "But it has just really changed the downtown." Looking ahead, the downtown die-hards are eager for restoration of The Landing and riverfront development. Bengel’s married son used to live in Milwaukee. "We loved visiting there because of all the river activity," she said. DeMeritt doubts whether all the ambitious plans will be full realized. It would take years and millions of dollars to fund riverfront development and create a proposed STEAM Park to support science, technology, engineering, arts and math. But she doesn’t mind local economic development officials getting ambitious. "If you’re gonna dream, you might as well dream big, right?" she said. "Just so it doesn’t all come out of taxes." Bailey-Reed can’t get over how quickly some private investment is happening downtown. During an interview with her co-worker, she said what she’d really like to see is a farm-to-fork restaurant. Bengel brought her up to speed on Tolon and Freshii, eateries built around healthy, fresh menus. The Golden, a new restaurant on the first floor of the Ash building, also focuses on fresh, quality ingredients sourced from socially conscious farms. "That’s how fast it’s growing, seriously," Bailey-Reed said. "I just learned about two new places while I’m sitting here." One thing remains missing, she said. A grocery. "We get a grocery store downtown," he said, "you can’t believe what all will happen."